Join us at Darwin’s landmark multi-award winning restaurant, Pee Wees. Nestled amongst tropical palms & located in the East Point Nature Reserve, Pee Wees idyllic waterfront location offers magnificent views across Fannie Bay and Mindil beach to the twinkling lights of Darwin in the distance. Sit back and get into the relaxed Darwin vibe. A Top Night in the Top End! Top End Dress Code: Flip Flops, thongs or fancy free. 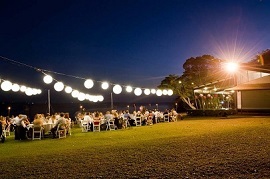 For those who’d like to party on we’ll take you The Precinct at Darwin Waterfront for afters.